Friday and time for Polkadoodles again!! Have you seen this amazing new collection we've just launched this week? It's time to Work and Play!!! This great new mini collection is superb and is the first in this new series of Work and Play themed collections - we're bringing you more soon! 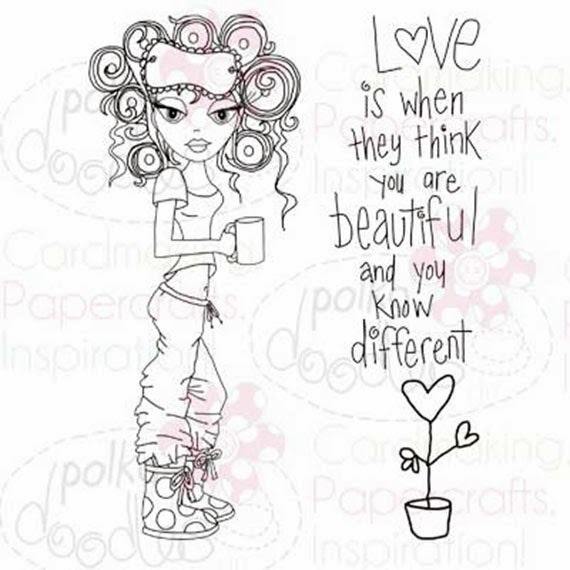 10 adorable Digi Characters in both black and white and colour, papers AND sentiments, toppers and more - OR you can also get these great digis on download separately from the Download store. Just click on the image to see more and find out what you get in the full collection!! The digis are all £2 each or you can get the whole collection for only £8.99 - total bargain or what! Ok, so let's get to the challenge! Last week we set you the challenge of SUGAR AND SPICE and the theme is still running until 7th March so you can still get your entries in HERE. challenge so there are no excuses not to enter!! 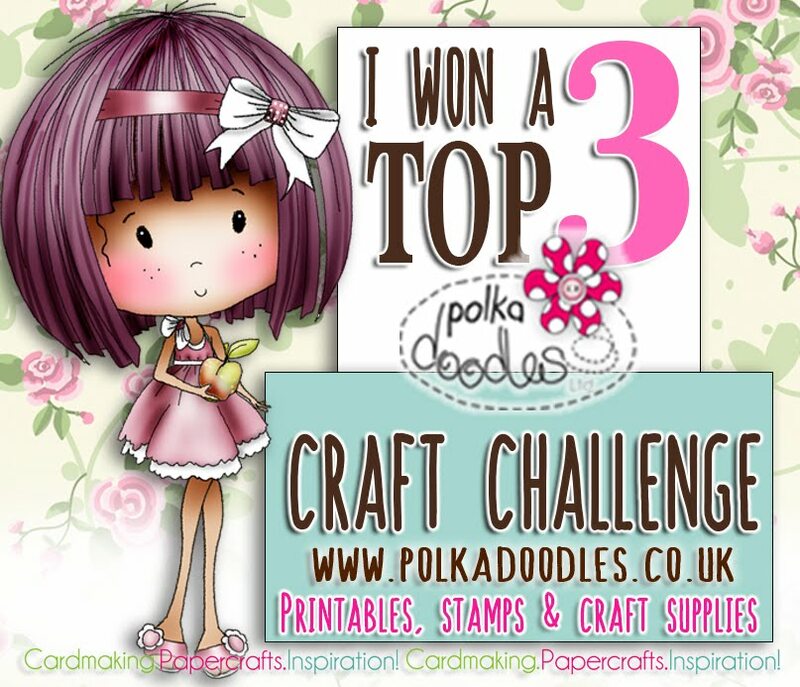 Polkadoodles goodie Bag worth £50! Woohoo!! This will include all sorts of stash including dies, cd's, stamps and who knows what else! 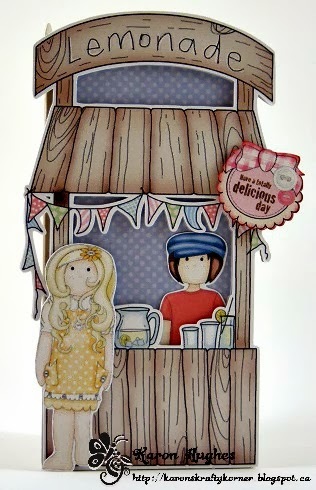 Karon - I decided to use the lemonade stand from the In the Garden section of the Studio 12 Picknix Collection 1CD. I made a shaped card by sizing the pre-coloured digi of the lemonade stand, layered it up to add dimension. The boy and girl pre-coloured images, and the sentiment, are from the Sundae of Seasons CD. 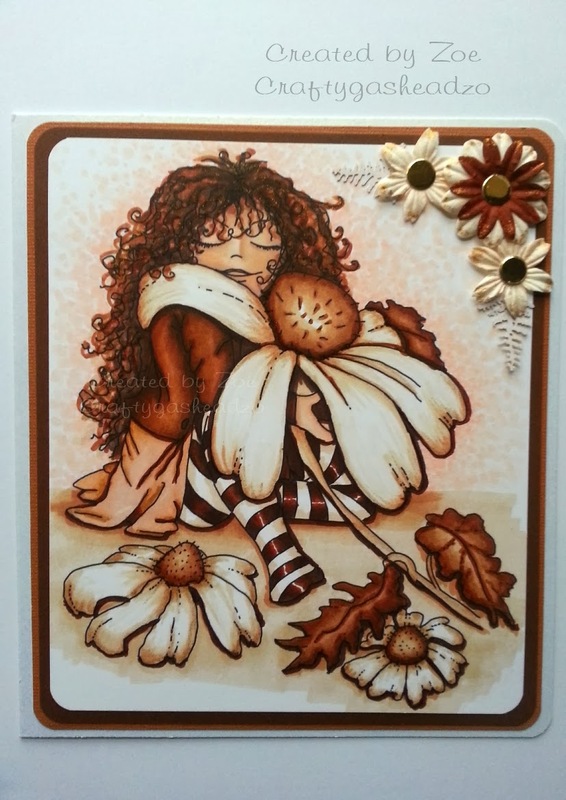 Zoe - I instantly thought of the colour palette when I saw this challenge so decided to colour an image I hadn't attempted before, this Daisy Lady (as I call her) is from the gorgeous Double Sprinkle of Kraft CD. I coloured her with a mix of markers including the fabulous Graph It's. Once finished I decided to keep it simple. I added a few flowers and some candi. I wanted to keep this card for any occasion so didn't put a sentiment on it deliberately. Sally - For this week's project I have made my step-granddaughter's birthday card. I took the image from Dollie Daydreams goes East CD Rom and coloured her with Graph'it markers. Then I took a backing paper and the alphabet into my graphic programme and made the card base. I then matted it onto black cardstock. I then matted the image on black cardstock also. Die cut out some cherry blossom and branches and then printed a sentiment scroll. I love how this has turned out. I hope she loves it too. 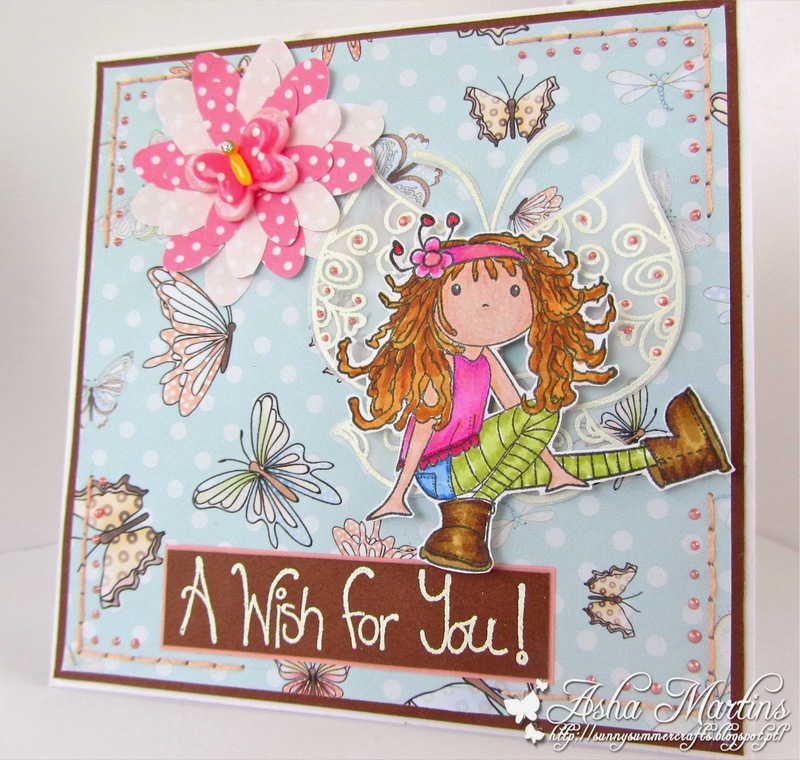 Asha - I'm using a girlie rubber stamp called "Gracie" from Polka Doodle's Fairy Flutterby series for my Sugar and Spice project. I coloured her with Graph It and Promarkers. 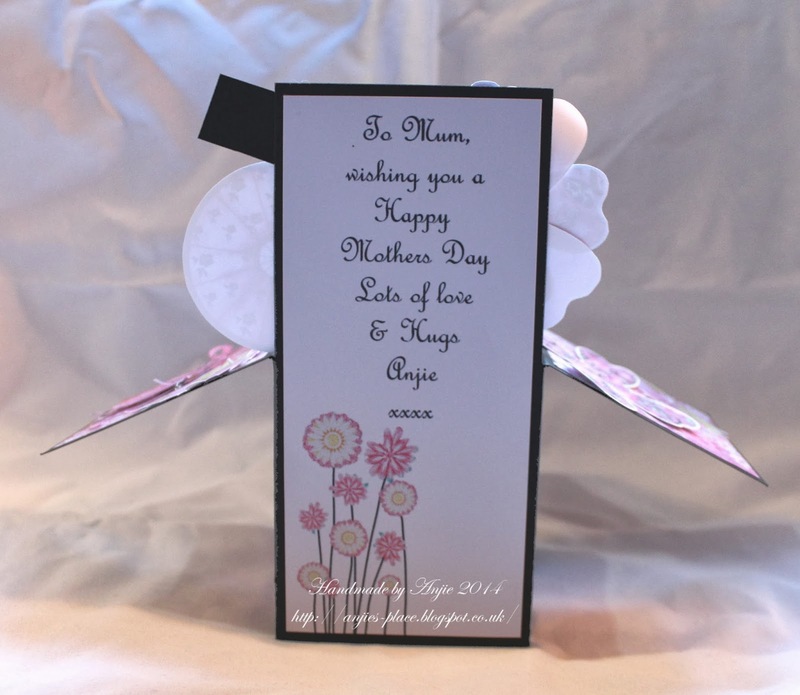 I stamped the butterfly from the Gracie set on vellum, heat embossed it in white and used it as wings for Gracie. The background paper is from the Bonbon Belles Double CD and the flower is from the Dollie Daydream Girl Talk CD. And voila! A sweet birthday card for a little girl. 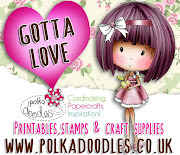 JAN - I used one of my favourite Polkadoodles CDs - 'Candy Doodles' to make my card this week. 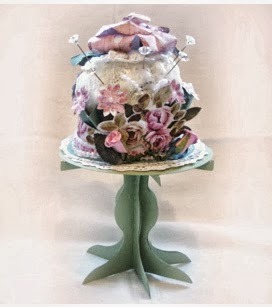 The Sugar & Spice theme made me think of sugared almonds - hence the colour scheme. The little girl is coloured to match using my Promarkers and I made the tickets, using a blank one and adding my own wording to match the theme. Alethea - When I think of sugar and spice I automatically think of yummy cakes and slices. 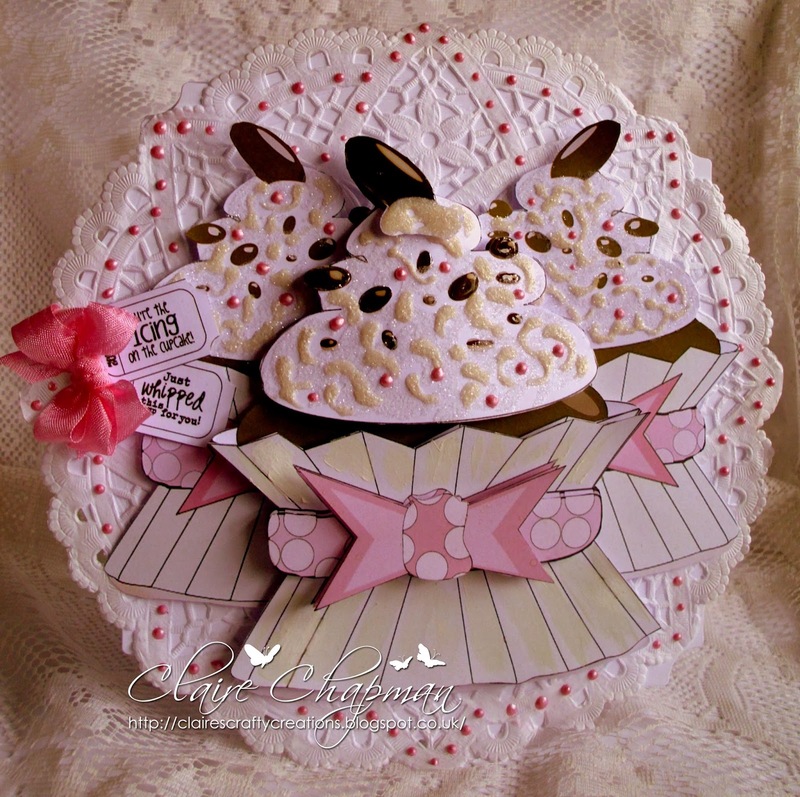 So I made this card using one giant cupcake from the Cherryblossom Lane cd collection and Dollie Daydream - Birthday digistamp which I coloured with tria markers! 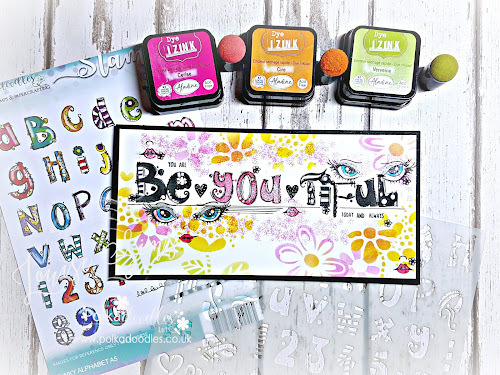 I then just added a few embellishments to finish off the card and the Polka Doodles birthday wishes sentiment from the Sensational Sentiments stamp set. Kerrie - Wow I have really enjoyed the Theme this week - 'Sugar & Spice' - for this I chose to decorate a Notebook to make myself a Recipe Book and decided to use the 'Sundae of Seasons' CDrom as I really love all the baking themed Embellishments and the Ragdoll charaters. The only things that were added not from the CDrom were Mirror Board & Gems from my Stash and the Notebook of course. I coloured the Digi Image from CDrom using alcohol markers. Fantastic inspiration from the team as always! Well done!! Email us here to claim your prize! Well done everyone! Don't forget to grab your blinkies from the sidebar! You have until Friday 7th March at noon GMT to enter the SUGAR AND SPICE challenge and please make sure you follow the rules which are in the sidebar. See you next week! Hi everyone, welcome to another Polkadoodles challenge! We've had a really busy week here as it was the UK's annual craft trade show last weekend so we were at the NEC for 3 days seeing all our lovely crafty friends and looking at what's new in the industry. 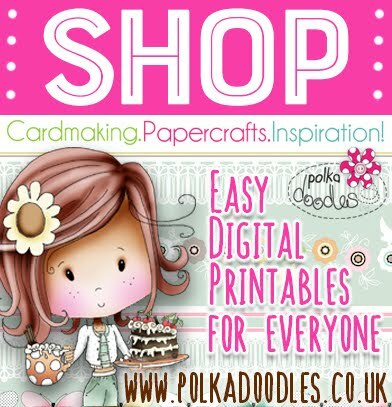 We have LOADS of fabulous new paper products on the website too which were launched at the show so make sure you head over to Polkadoodles now to have a look! Also, just a little reminder about our Social Networks - did you know you can find us on Facebook, Twitter and Pinterest? So come and join us and get all the heads up on new stuff and all the news and gossip before anyone else gets it! You can interpret this how you wish, it can mean lots of things to lots of people! We are playing catchup with our new rules since changing the entry dates so we don't have a winner to announce this week but we hope you'll join in this great challenge and join us again next week too. Don't forget our other challenge at Digi Choosday is on the go for you to enter and also make sure you head over to the Studio 12 where we have THE most amazing inspiration for you this week! 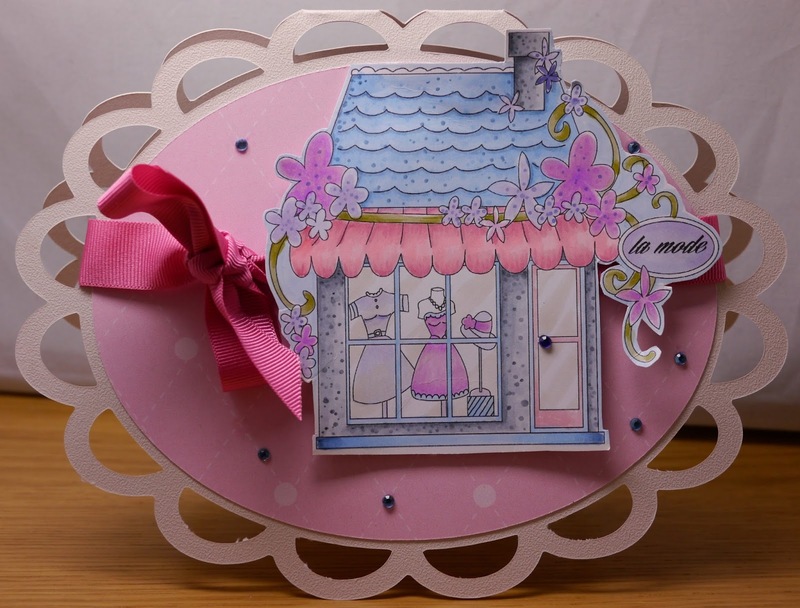 Bev here, for my project I went with a shaped card using a template from the brilliant Paper Boutique Vol 1 CD Rom it's so easy to use and the end result looks fab, I'm sure you'll agree. Lou: I've gone for the traditional "Sugar and Spice" for my project and have made a baby card to welcome a new baby girl. The papers and bear image are from a Sundae of Seasons CD (Spring section) with the remainder of everything else being made using a plethera of Studio 12 stamps. Full details of everything used can be found on my blog HERE. Patty - Ohhh Sugar and Spice. All papers and images are from the Sugarplum daisy CD collection. added the two contrasting mini bow, inked the edge of the image and as a finished touch the purple rhinestones at the right bottom. So there's our inspiration this week! Remember you have until 7th March to enter this one and there's that big £50 prize up for grabs so make sure you're in it to win it! We look forward to seeing all your great creations as always and we'll see you here again next week! Happy Valentine's day everyone! May your day be filled with love and romance today with flowers, chocolate and glitter! 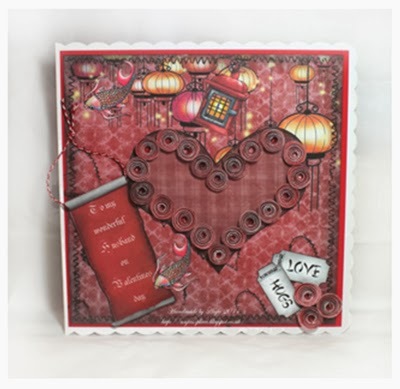 Before we get to today's challenge our very gorgeous and talented Jan has a fantastic tutorial for you today so make sure you check out her blog HERE to get a great idea and some fab inspiration! We love it! ....we'll be bringing you some great blog hops between the teams and lots of fun things in the coming weeks so you don't want to miss out on our blog feed! as the theme for today. We are changing our rules slightly here so you now need to follow the challenge theme please! The great news is we are now giving you even longer to enter though so you now have until Fri 28th Feb at noon to enter! 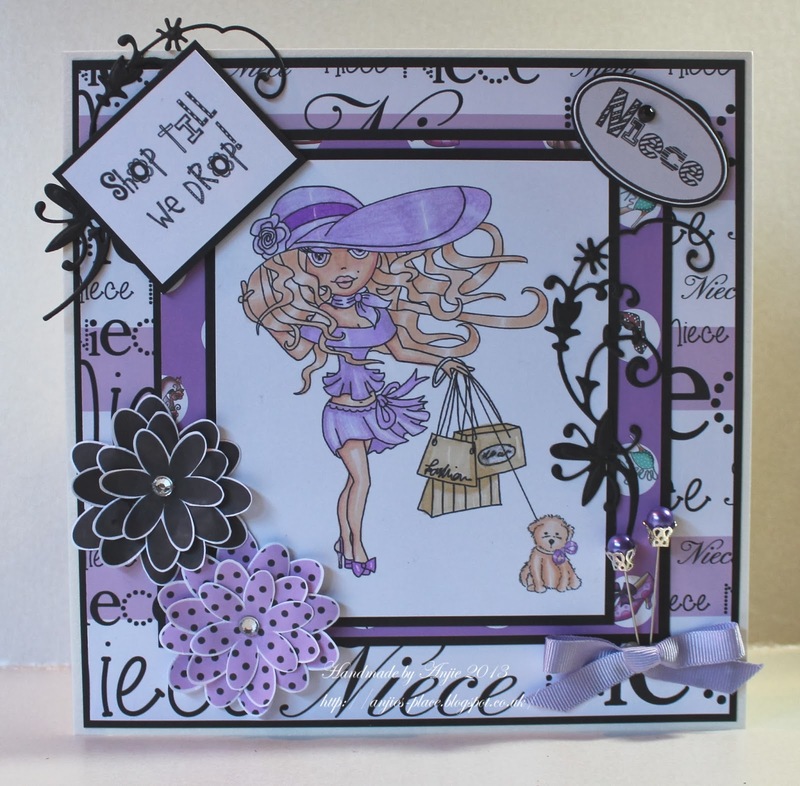 The winner of this challenge will win our brand new Dollie Goes East collection! Lizzie - For my card I used my Graphics program and used a heart shaped outline. I then filled it with Dragonflies and Butterflies resizing and flipping them from the Dolly Daydream Goes East CD. The sentiment is also from the CD, I'm so loving this CD !! I then printed and cut out the heart so you cant see the outline. 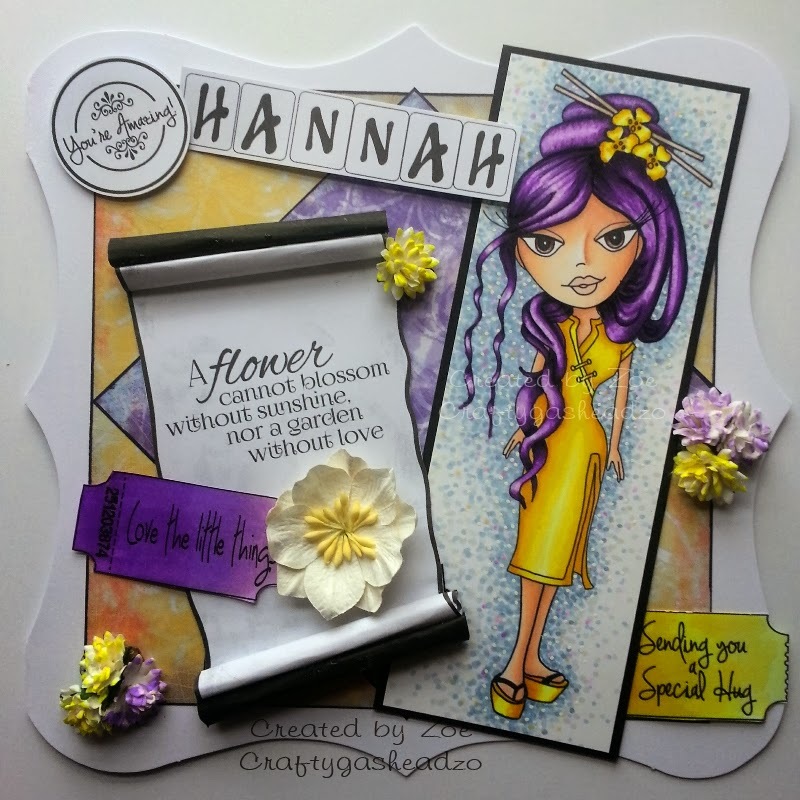 Ruth: I've kept it very clean and simple again this week - I've used the Sleepyhead digi but only used the sentiment which has been coloured with Promarkers and glossy accents. A few half pearls and the job is done! Zoe - So love is in the air today, but I thought I'd go off the usual and use the non traditional colours of purple and yellow to design this card. 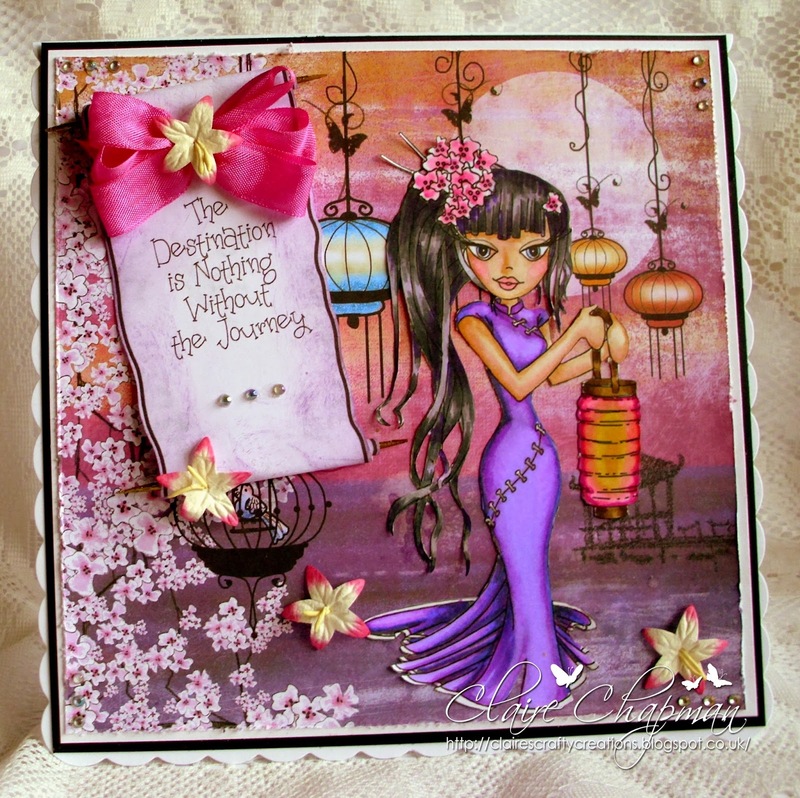 I used the stunning Dollie Daydream goes East collection to print off papers, sentiment scroll, embellishments and gorgeous image. I coloured the image with markers including Graph It's and used them to coordinate the tickets and flowers. I absolutely love this collection!! 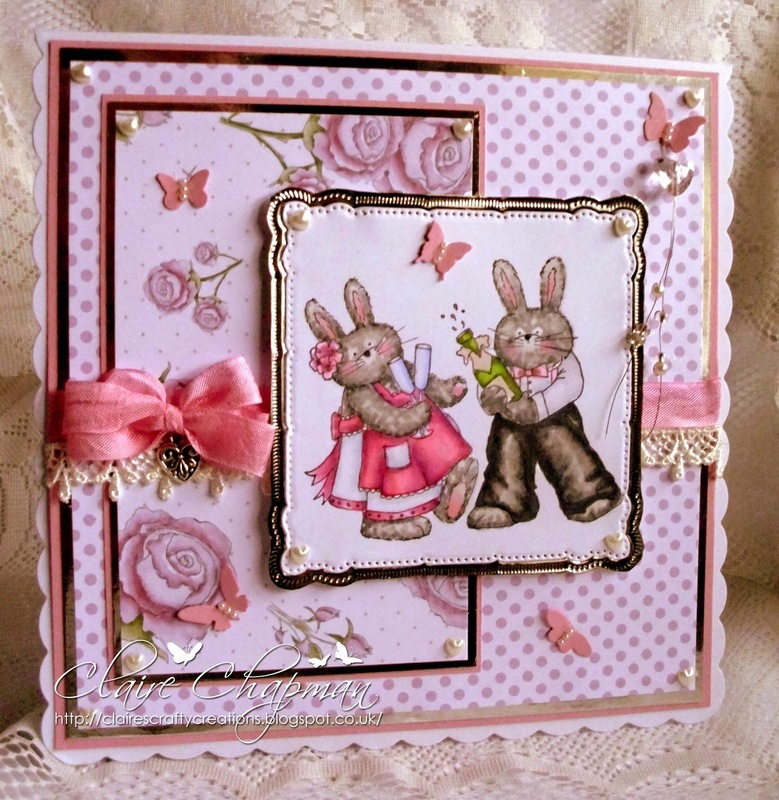 Claire C I've used the fab Cherry Blossom Lane Cd for my card, these bunnies are adorable! I've coloured the image with Graph'It markers (the warm greys and pink greys are perfect for fur) and used a couple of the gorgeous bps from the CD too. Shell- At the moment I have a thing for cas cards and this image is just perfect for this style...I have used one of the new Dollie images and have coloured her with copics and promarkers. You can get Dollie here..I then just added a ribbon and a few brads to finish it off. Susan For the Love theme this week I have used an image from the Fredericka CD also available as a digi download and coloured her with Graph'It markers.The papers are from the Picknix collection. Fantastic cards this week, so pretty! Don't forget you MUST follow the Love challenge theme and get your entries in by 28th February. So let's get to last time's winner. Well done Erin!! You won a copy of our Goes East collection worth £15! Well done everyone, grab your blinkies and email us here to claim your prize Erin! Please don't forget that we will be back on Tuesday over on the Digi Choosday blog with another great digi challenge but We will see you back here next week! 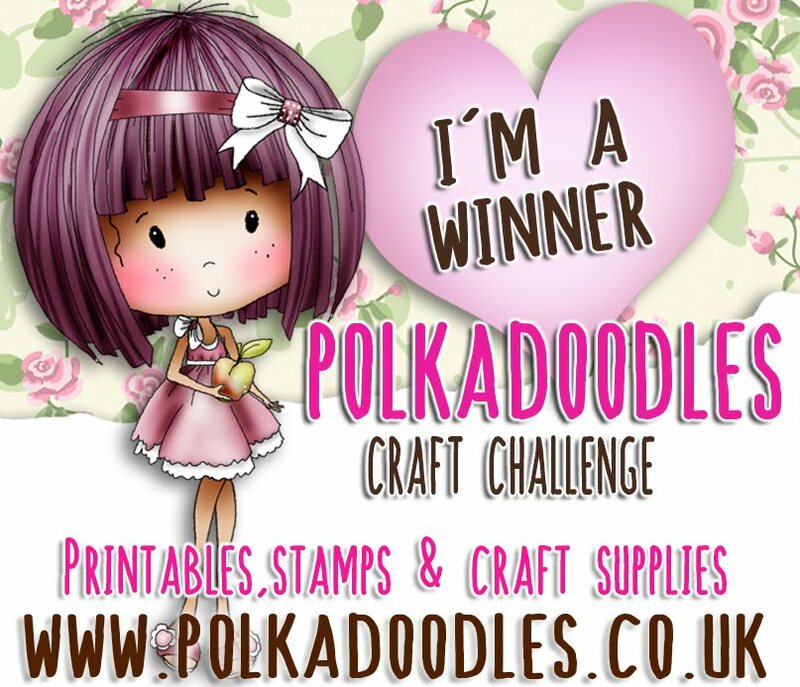 There is also a fantastic challenge between the Graph'It team and the Whimsy Stamps digi team going on today so make sure you go and check it out, there are lots of prizes up for grabs with over £100 of giveaways going on! Hi everyone and welcome to an uber exciting Digi Choosday! For this week's challenge click below!!! 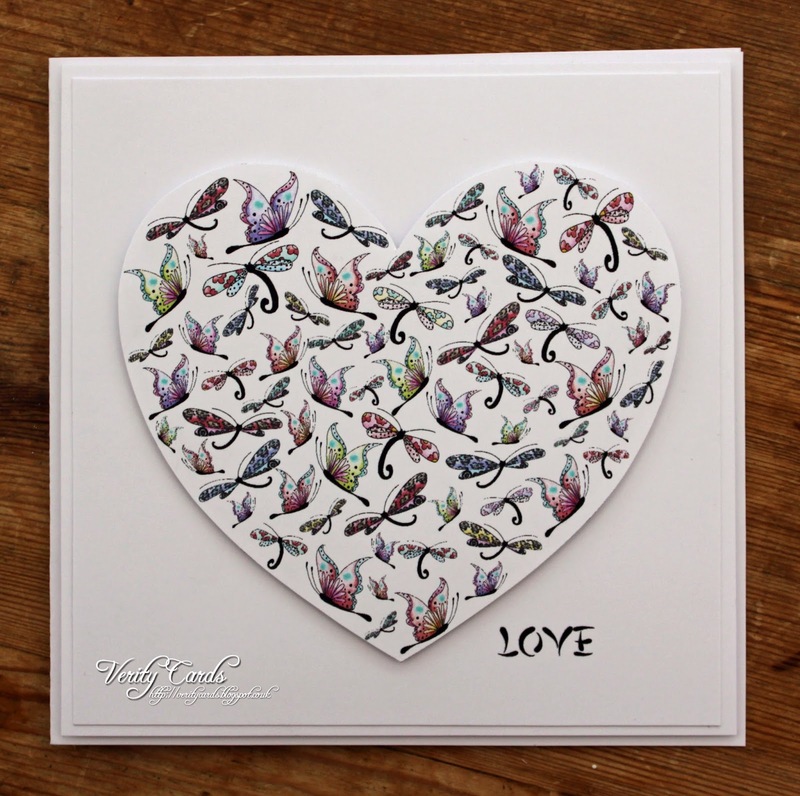 Good morning, Claire C here with a very quick tutorial for the gorgeous scroll sentiments from Dollie Goes East. Here's a pic of the finished card. be updated regularly with new Digis. We have made a couple of changes to this blog which we hope will make things a little better for you! We are also now taking sponsors too so if you are on any teams which wish to sponsor us please email us! 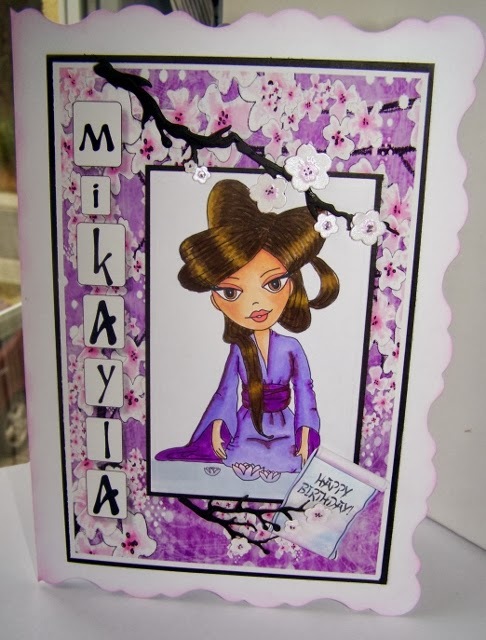 The DT were challenged to use the new Dollie Daydream Goes East collection but they were not allowed to make cards! Of course YOU can make any paper project you wish! So you have until Friday 21st Feb at noon to enter this challenge and to celebrate the changes we will give a copy of our fabulous GIRL TALK Collection on DOWNLOAD to our Top 3 Favourites AND the Random Winner will also receive the collection too!! This download is worth £14.99! So make sure you get your entries in! JAN: Well, if it isn't a card it seems to be a tag these days! I love them - here's what I did with the fabulous new 'Dollie Daydream goes East' collection. Everytime Nikky designs a new collection, I think it's my favourite - but I really fell in love with this one. All papers and elements are printed from the CD and Dollie is coloured with my Promarkers to co-ordinate with the lanterns - don't you just love the tiny little scroll! 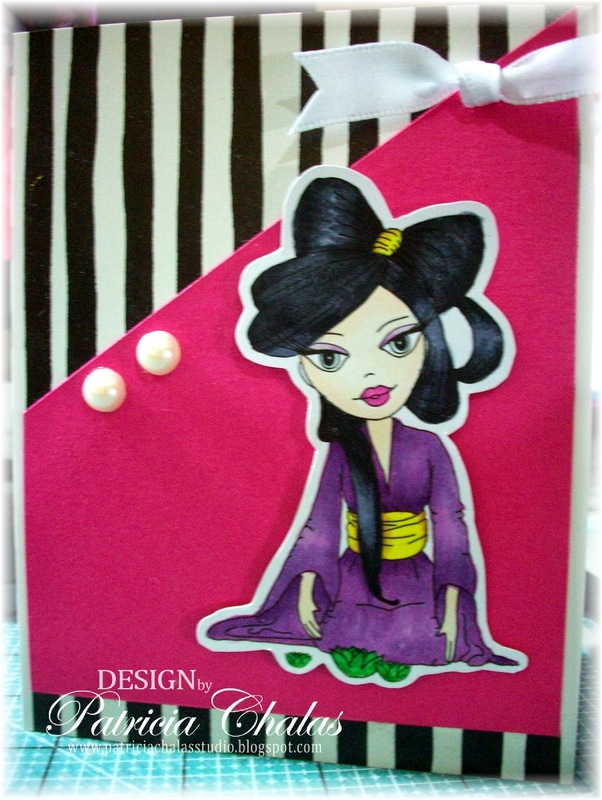 Asha - The brief for the DT this week is to show a little oriental love but not in a card. Perfect! I went ahead and made this money / gift voucher wallet... who says money can't buy you love! This image is just one of the many gorgeous ones found in the Dolly Daydream Goes East Download Collection. I coloured the little dollie with Graph It and Promarkers. The backing paper is soooo lush, you really don't need (or want) to over-embellish. I just used some sheer lilac ribbon for the belly band. 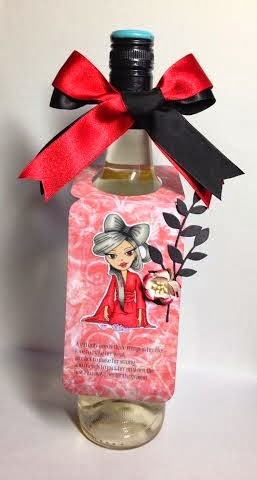 Bev here with a lovely bottle tag (my own design) made using the fabulous new Dollie Daydream Goes East CD. The tag itself is printed using the lush backing papers, I added a sentiment in my graphics programme before cutting out. I decorated it with one of the beautiful digi stamps that I coloured in with Graph'it Markers adding a flower and die cut foliage. It makes a lovely little finishing touch to a bottle/gift. Sally - Well how cute is this? This little box is on the template section of the Dollie Daydreams Gone East CD Rom. I printed the template onto cardstock, then printed the backing paper over the top, cut it out and put it together. I need a flower or some thing for the top, so I cut out two of the flowers from the backing paper and then added a button for the centre and then a sentiment. Alethea - I can't seem to get into the whole love thing I guess cos I have been single so long :) but I do love the new Dollie Daydream Goes East cd. 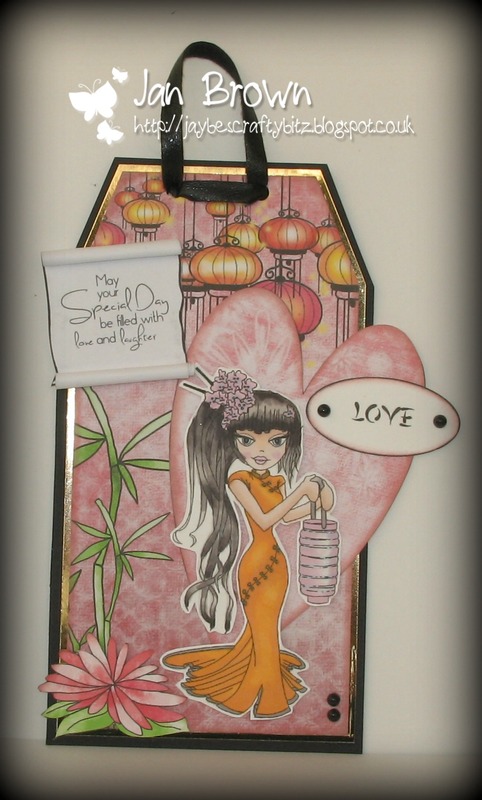 I decided to put together this fan using the template from the Dollie Daydream Goes East cd. I printed the papers (which are also from the Dollie Daydream Goes East cd) first then printed the template on top of that! 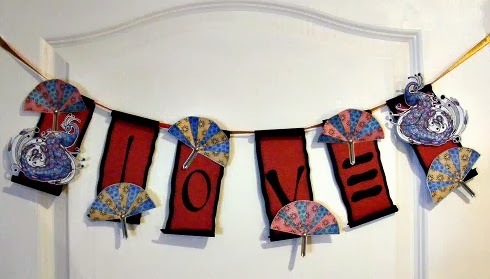 I needed to incorporate love somehow so ended up printing the word "love" (also from the Dollie Daydream Goes East cd) onto one of the fan sections. I then printed off one of the Oriental girls and I think this is the first time in a very long time that I actually coloured in the image myself! Karon - Well we are all in love with this fabulous new collection - Dollie Daydream Goes East. 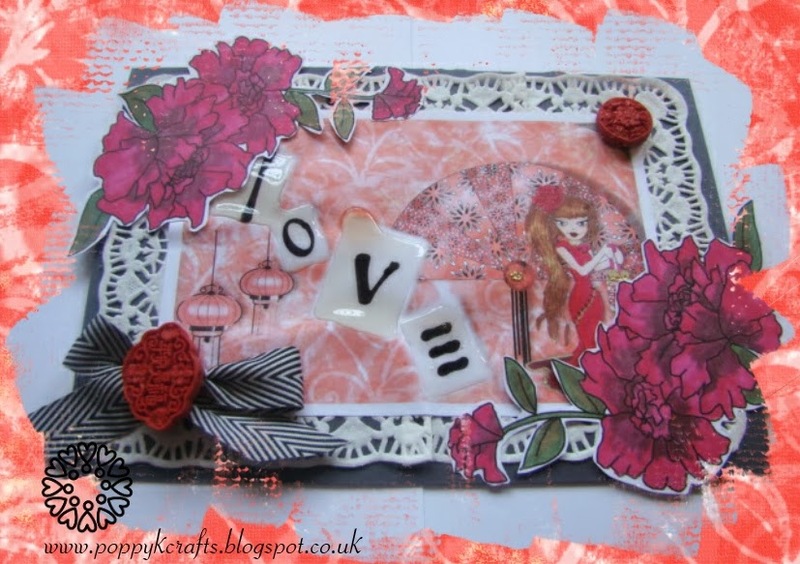 I decided to make an Oriental Valentines banner :-) All the elements are from this fabulous CD. 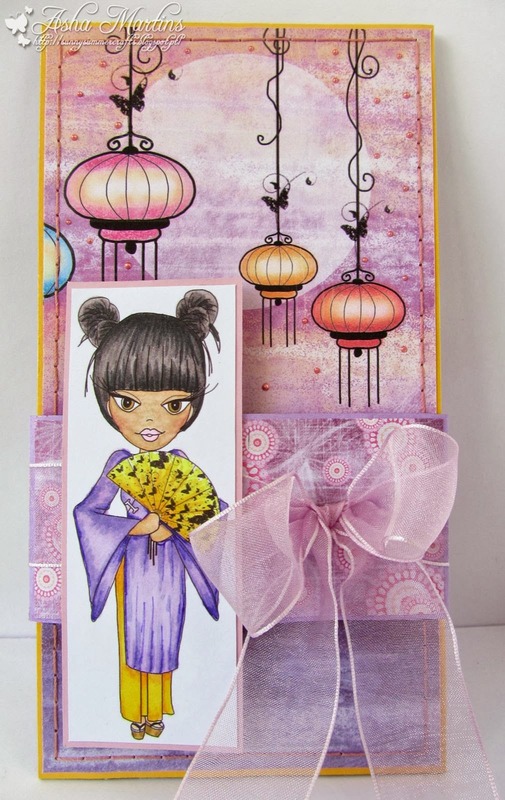 Anjie - It's not my turn for the Polka Doodles challenge this week but I'm having so much fun with the new Dollie Daydream Goes East CD Collection that I thought I'd gate crash! This box folds flat to fit in an envelope and is so eye catching, I just love it! Everything I have used on it comes from the CD. Kerrie - Oh Wow!!! 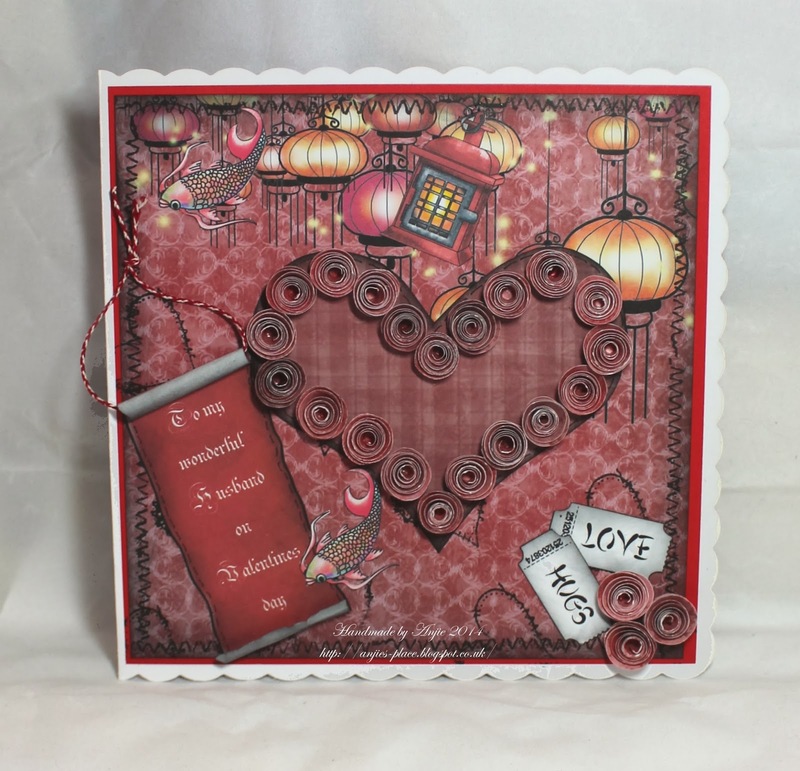 I love this 'Dollie Goes East' CDrom collection and when I saw the theme of this Challenge I was very pleased the DT have been challenge to 'Oriental Love' but not a Card eeeek!! So I had a think of what I could make and decided on an upcyle project a pot for some of my fave pens using a famous crisps mini-tub and then I wanted to make a tag to go with it. 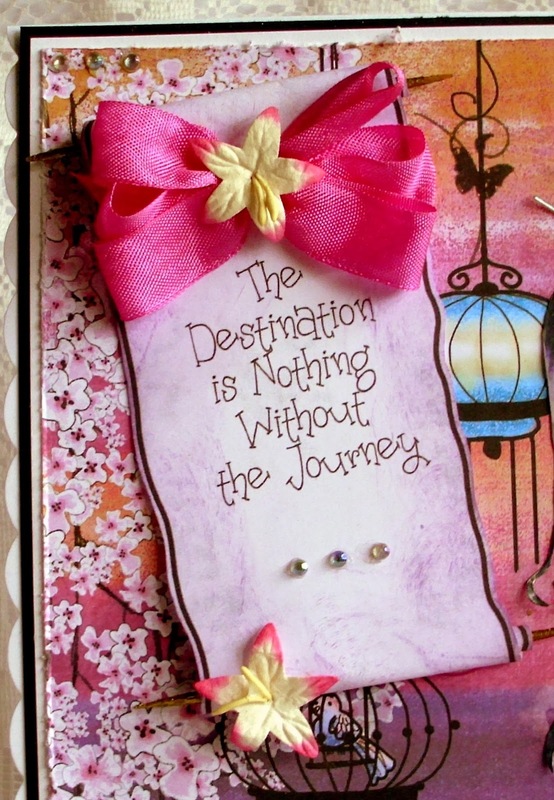 I have used Papers, Embellishments, Digi's, Sentiment, Build-a-Fleurs and Letter Tiles from the CDrom. WOW!! AMAZING makes from the team this week I'm sure you'll agree!! 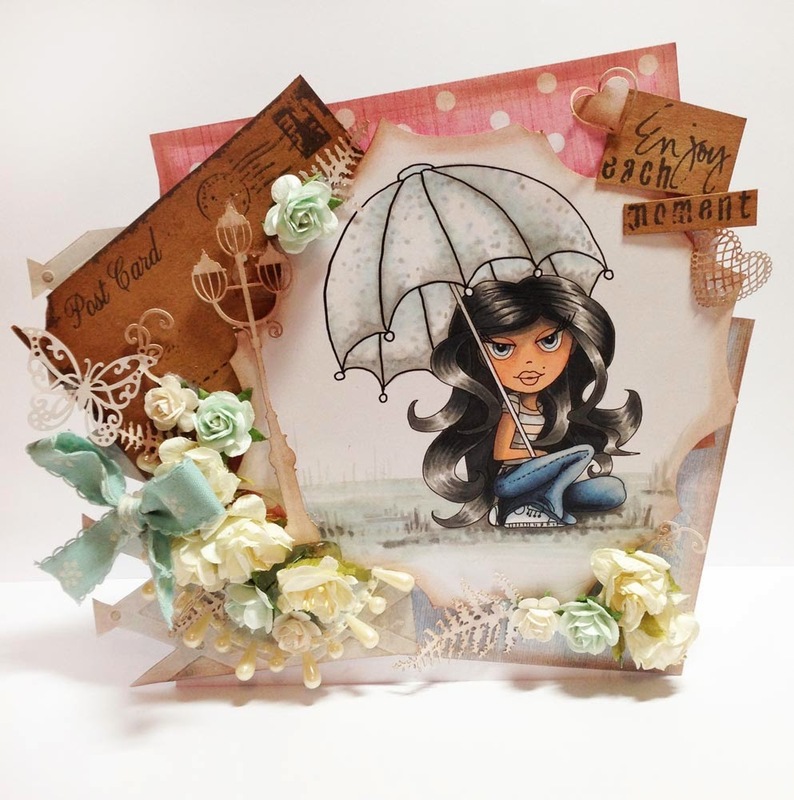 of the Dollie Daydream Collection worth £15! Well done everyone, don't forget to grab your blinkies!! this makes it fair as we now choose the winner with Random Org. 2. Maximum two entries per person! Morning everyone and welcome to another Digi Choosday challenge! 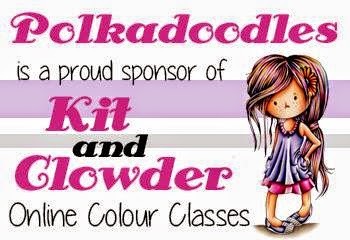 Also, don't forget that you can catch Nikky on Create and Craft TV this Friday with another Graph'It colouring show - so we hope you can tune in! We are also still looking for another new teamie here at Digi Choosday so if you love to use Digis then get in touch with us here and tell us why you'd like to be on the team with us! Shopaholic twist for the Design Team, and boy o boy have they come up with some great ideas for us this week! We have a little change to our challenge today as we have decided to extend our entry dates for you all - so from now on you will have THREE WEEKS TO ENTER the challenge! Woohoo! That means it's not quite such a rush for you all hopefully! So you have until Tues 25th Feb to enter this challenge and the winner will get a fabulous download collection and our Top 3 will also win a download too! The winner of this challenge will be announced in our post on 4th March! So let's see what the team have made - you can see last time's winners below the post! Zoe - So challenged to do 'Shopaholics' I instantly thought of my time in Paris (2011) & the ultimate shoe choice (though I confess they are not mine, I merely got to try them on!). 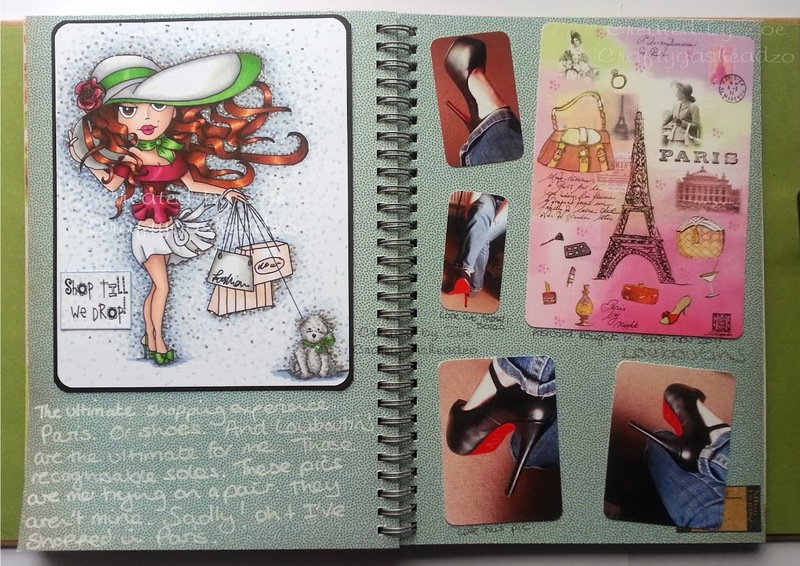 I used this fabulous digi from the Dollie Daydream Girl Talk collection as a main image on this Smash Book double page spread. I coloured the image with Graph It markers which I also used to create the dotty background behind her. I added journaling, a postcard and photos to document my memories. I often use digi images on different projects as I reckon they add personality! Anjie - On my card the image, papers, flowers and sentiments are all from the Dollie Daydream BONUS EDITION Girl Talk BCD Collection. I have coloured the image with Graph'It Markers and added a bow, some die cuts and some hat pins. I think the black card behind the papers and image really brings out the papers. When cutting out the flowers from the build-a-fleur section I always leave a white border around them to make them pop out more as well. Susan -For this weeks challenge I have used Dollie Daydream Collection. Sally - Hello, It's Digi Choosday! Today, I decided to do a gift bag. I took backing papers and a image from the Dollie Daydream CD Rom into my Craft Artist programme and put the image together. I then printed it off, matted it onto some turquoise cardstock and adhered it to the paper bag. 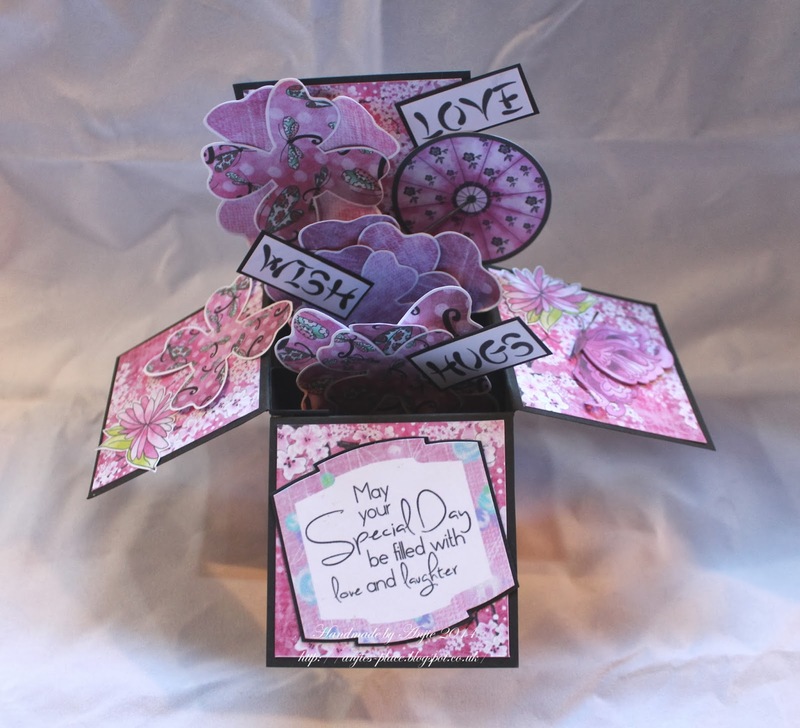 I then printed off some build your own flowers and sentiments also from the CD rom. Cut the flowers out and put them together and added a button. Then added the sentiments. There it is, a lovely gift bag. What great inspiration for us! No 10 Mirella - well done! Well done everyone, your entries were superb, thanks so much for playing along!